I don’t know about you, but I look forward to the employee benefits renewal process. Call me mad, but I enjoy sitting down with my benefit providers and having the opportunity to dig into the details on how the programs are working and opportunities to make them even better. This is important to our business – making sure we are getting a return on investment on our benefits spend, and to our employees – making sure that these benefits are engaging and supporting them. Since I’ve been through this process many times, I thought I’d share with you four tips on how to get the best out of your renewal process. It may seem obvious, but my first tip is to make sure that you do it. No matter how well things are going with your employee benefits program and/or how busy you are with other priorities, you shouldn’t skip this important process. Think of it like you would a medical physical – we may not like going to the doctor to have one, but we sure are glad after we’ve had one! As the expression goes, data is king, meaning it can give you a wealth of helpful information. Use this data when renewing your benefits, requesting as much as possible from your provider, for when it comes to data you can never have too much! Your data can be so powerful, helping you understand how your employees are using (or not using) a benefit, and if/how your benefit plan should change. For example, I was recently renewing our health cash plan and saw that the plan covered areas which were not being used, but did not include areas which our employees would use/value. I worked with our provider to use the data to help us re-design the plan, creating one which was a more engaging and comprehensive benefit. Multiple years of data. Was last year’s data a blip or meaningful trends? For example, let’s say our health cash plan data showed that no one had used the visual element of the plan this year. Does this mean that it is not needed or was it a blip? Maybe everyone had gotten new glasses the year before, so it wasn’t needed this year. Make sure your decisions reflect these multiple years of data. Changes in the business. If/how will your business change over the years? For example, will your demographics change, the locations of your offices, etc? Changes in the marketplace. What trends are happening in the marketplace? For example, are providers adding services which my current provider cannot, does my plan design not align with how the market is moving? Employee voice. What are your employees asking for, and is this reflected in what you currently have? 4. Say it again. To everyone. 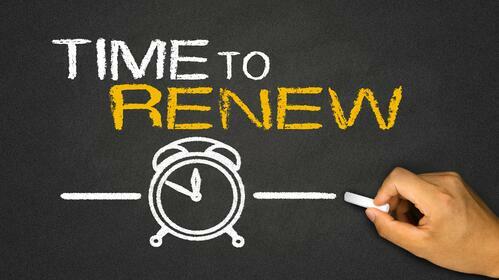 The renewal process gives you a great time to go out and ‘say it again’, re-marketing your benefit plan to your employees. It gives you the opportunity to remind employees how great the benefit is, why they should value it, participate in it, whatever your objectives may be. This can create re-engagement with the benefit by creating excitement and interest. Keep these general tips in mind, and the renewal process will become smoother and more effective.